Historical figures often become the stuff of legend with anecdotes being spun into greatly exaggerated versions of what at one time may have been the truth. George Washington’s cherry tree and Newton’s apple are good examples of this, but perhaps the granddaddy of fact becoming fiction is the story of Saint Nicholas. Who was this man, and how has his legend grown to what it is today? To find out we’ll need to travel back to where it all began somewhere in the neighborhood of Patara, circa 280 A.D. – near what is now Myra in modern Turkey. The young Nicholas that would grow up to be a monk, or Bishop, in the 4th century is said to have had a generous and giving spirit throughout his life. He is also reported to have given up all of his wealth and possessions in order to help those in need. Some of the stories involving Nicholas have him saving individuals from lives of slavery, including three sisters who were offered up for sale by their own father. Another account has him rescuing a boy named Piter from a similar fate, with the young Ethiopian pledging loyalty to Nicholas and following him on his quest to bring relief to others. Because of his generosity and willingness to help the downtrodden, Nicholas became well known through the region, especially as a protector of children. He was made a saint after his passing and a feast in his honor was established on the 6th of December, the day that marked his death. The Feast of St. Nicholas soon became one of the most popular traditions that filled the long winter season, and Nicholas himself was among the most loved saints throughout Europe. By 1087, everyone wanted a piece of St. Nicholas, literally, with the town of Bari, Italy mounting an official expedition to locate the tomb of the well known saint. His reliquary was desecrated; his remains and artifacts relocated to Bari, where they still reside to this day. Long after the veneration of saints was discouraged by the Protestant Reformation in the 16th century, Saint Nicholas was remembered for his courageous and generous nature — although by this time, some of the details of his life had begun to take on some of the legendary qualities with which we’re now familiar. The Feast of St. Nicholas began to be associated with other Yule time celebrations, and tales of St. Nicholas leaving gifts for good little boys and girls spread. This tradition blurred with one usually associated with the Norse god, Odin. Odin was often described as having a long white beard, and was sometimes identified as Jolnir, or the Yule Father. Odin was also said to lead hunting parties across the night sky, flying on his eight legged horse, Sleipnir. Children would leave their boots out for Sleipnir, filling them with hay and sugar for the steed to eat during Odin’s journey. In return Odin would leave candy and small gifts inside the boots to thank the children for their kindness. The boots were usually left near the hearth, often associated with ideas of warmth and prosperity. This custom quickly spread through Scandinavia, as well as Germany, Belgium, and the Netherlands. As Christianity began to flourish in the region, so too did the story of Saint Nicholas. Elements of the tradition involving Odin and his horse were folded in and St. Nicholas was soon depicted as having a long beard and riding upon a large white horse. Piter, the child that was saved from a life of slavery, became Nicholas’s helper as he delivered presents to the children. The small boy was able to climb on rooftops and deliver gifts down the chimney. He was soon identified as Black Peter, and today is usually seen dressed as a diminutive chimney sweep covered in soot. Some argue that the name was ethnically influenced due to Piter’s Ethiopian heritage, while others point out that Odin was also depicted as having similarly themed helpers in both his ravens that would report information back to him, and Norwi, the dark father of the night. As the legend of Saint Nicholas grew throughout much of Europe, the name also morphed into “Sinter Klaas” in some regions. Other names began to be associated with Nicholas including Pere Noel, or Father Christmas. Nicholas was even associated with Christkindl, which translates as Christ Child in German but soon became the more familiar Chris Kringle. The Christkindl was usually depicted as an angelic creature that filled the same role of helper as Black Peter. As the idea of St. Nicholas spread throughout Europe each region mixed in elements from their existing traditions, and created new ones along the way. Sinter Klaas was brought to America in the late 1700s by Dutch immigrants, with New York newspapers reporting celebrations of the Feast of St. Nicholas in both 1773 and 1774. Within a few years, Sinter Klaas was Americanized to “Santa Claus”. While the name stuck his appearance wouldn’t be firmly established for quite some time. In 1804, John Pintard of the New York Historical Society distributed woodcuts of St. Nicholas to other members of his group. Nicholas wore the traditional vestments of the clergy including robes and miter board, however the background depicted stockings filled with fruit and toys hung over a fireplace. Washington Irving included Santa Claus in his fictional History of New York, even making Nicholas the city’s patron saint. Still the description of Santa ranged from a rascal wearing a blue tri-corn hat, red vest, and yellow stockings, to an old man adorned in Flemish trunk hose, a rather elaborate style of pantaloon. 1822 saw the publication of a poem that would change everything, An Account of a Visit from St. Nicholas. Originally published anonymously (due to its “frivolous” nature) by Episcopal minister, Clement Clarke Moore, the poem helped to cement the idea of Santa Claus firmly in the public conscience. Best known by its opening line, Twas the Night Before Christmas, the piece established such trappings as the a team of reindeer and sleigh, along with Santa’s ability to enter and exit a dwelling via the chimney. Drawing inspiration from the poem, artist Thomas Nast created the first image of our modern Santa Claus in 1863. 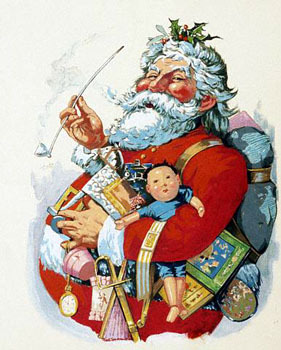 In a cartoon appearing in Harper’s Weekly, Santa is shown as a cheerful man with a full white beard holding a sack full of toys. He’s also seen wearing a red coat and pants, trimmed in white fur and accented by black boots and belt. Thomas Nast would also create ideas like Mrs. Claus and the band of elves that help Santa with his annual mission. He introduced the notion of Santa’s North Pole workshop in a collection entitled Santa Claus and his Works. The book of illustrations was accompanied by a poem written by George P. Webster that included a description of Santa’s home near the North Pole, in the ice and snow. The image created by Thomas Nast would be further set as that of Santa Claus when another artist, Haddon Sandblom, used it as inspiration in a series of ads for Coca-Cola in the 1930’s. This eventually lead to a popular urban legend that Santa wears the red and white suit because of the cola company’s trademark colors, in spite of the fact that Thomas Nast had originally designed the well recognized costume 60 years before the ad campaign initially ran. Today, Santa Claus is firmly associated with the Christmas Season and his likeness is the most recognizable image in the world, leaving Ronald McDonald a distant second. The US Postal Service receives bags of letters addressed to Santa every year. NORAD even tracks Santa’s progress every Christmas Eve, dedicating a special website to the event at www.noradsanta.org.